An externality exists when a person makes a choice that affects other people in a way that is not accounted for in the market price. 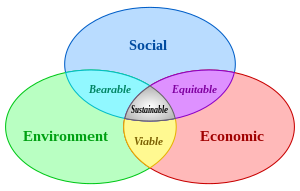 An externality can be positive or negative, but is usually associated with negative externalities in environmental economics. For instance, water seepage in residential buildings occurring in upper floors affect the lower floors. Another example concerns how the sale of Amazon timber disregards the amount of carbon dioxide released in the cutting. [better source needed] Or a firm emitting pollution will typically not take into account the costs that its pollution imposes on others. As a result, pollution may occur in excess of the 'socially efficient' level, which is the level that would exist if the market was required to account for the pollution. A classic definition influenced by Kenneth Arrow and James Meade is provided by Heller and Starrett (1976), who define an externality as "a situation in which the private economy lacks sufficient incentives to create a potential market in some good and the nonexistence of this market results in losses of Pareto efficiency". In economic terminology, externalities are examples of market failures, in which the unfettered market does not lead to an efficient outcome. Environmental regulations. Under this plan, the economic impact has to be estimated by the regulator. Usually this is done using cost-benefit analysis. There is a growing realization that regulations (also known as "command and control" instruments) are not so distinct from economic instruments as is commonly asserted by proponents of environmental economics. E.g.1 regulations are enforced by fines, which operate as a form of tax if pollution rises above the threshold prescribed. E.g.2 pollution must be monitored and laws enforced, whether under a pollution tax regime or a regulatory regime. The main difference an environmental economist would argue exists between the two methods, however, is the total cost of the regulation. "Command and control" regulation often applies uniform emissions limits on polluters, even though each firm has different costs for emissions reductions, i.e., some firms, in this system, can abate pollution inexpensively, while others can only abate it at high cost. Because of this, the total abatement in the system comprises some expensive and some inexpensive efforts. Consequently, modern "Command and control" regulations are oftentimes designed in a way that addresses these issues by incorporating utility parameters. For instance, CO2 emission standards for specific manufacturers in the automotive industry are either linked to the average vehicle footprint (US system) or average vehicle weight (EU system) of their entire vehicle fleet. Environmental economic regulations find the cheapest emission abatement efforts first, and then move on to the more expensive methods. E.g. as said earlier, trading, in the quota system, means a firm only abates pollution if doing so would cost less than paying someone else to make the same reduction. This leads to a lower cost for the total abatement effort as a whole. Quotas on pollution. Often it is advocated that pollution reductions should be achieved by way of tradeable emissions permits, which if freely traded may ensure that reductions in pollution are achieved at least cost. In theory, if such tradeable quotas are allowed, then a firm would reduce its own pollution load only if doing so would cost less than paying someone else to make the same reduction, i.e., only if buying tradeable permits from another firm(s) is costlier. In practice, tradeable permits approaches have had some success, such as the U.S.'s sulphur dioxide trading program or the EU Emissions Trading Scheme, and interest in its application is spreading to other environmental problems. Better defined property rights. The Coase Theorem states that assigning property rights will lead to an optimal solution, regardless of who receives them, if transaction costs are trivial and the number of parties negotiating is limited. For example, if people living near a factory had a right to clean air and water, or the factory had the right to pollute, then either the factory could pay those affected by the pollution or the people could pay the factory not to pollute. Or, citizens could take action themselves as they would if other property rights were violated. The US River Keepers Law of the 1880s was an early example, giving citizens downstream the right to end pollution upstream themselves if government itself did not act (an early example of bioregional democracy). Many markets for "pollution rights" have been created in the late twentieth century—see emissions trading. According to the Coase Theorem, the involved parties will bargain with each other, which results in an efficient solution. However, modern economic theory has shown that the presence of asymmetric information may lead to inefficient bargaining outcomes. Specifically, Rob (1989) has shown that pollution claim settlements will not lead to the socially optimal outcome when the individuals that will be affected by pollution have learned private information about their disutility already before the negotiations take place. Goldlücke and Schmitz (2018) have shown that inefficiencies may also result if the parties learn their private information only after the negotiations, provided that the feasible transfer payments are bounded. In the field of law and economics, environmental law is studied from an economic perspective. The economic analysis of environmental law studies instruments such as zoning, expropriation, licensing, third party liability, safety regulation, mandatory insurance, and criminal sanctions. A book by Michael Faure (2003) surveys this literature. ^ "Environmental Economics". NBER Working Group Descriptions. National Bureau of Economic Research. Retrieved 2006-07-23. ^ Illge L, Schwarze R. (2009). A Matter of Opinion: How Ecological and Neoclassical Environmental Economists Think about Sustainability and Economics . Ecological Economics. ^ Hanley, N., J. Shogren, and B. White (2007). Environmental Economics in Theory and Practice, Palgrave, London. ^ Chapman, Same (May 3, 2012). "Environmental degradation replaces classic imperialism". The Whitman College Pioneer: Whitman College. ^ a b Ostrom, E. 1990. Governing the Commons. Cambridge: Cambridge University Press. ^ Harris J. (2006). Environmental and Natural Resource Economics: A Contemporary Approach. Houghton Mifflin Company. ^ Myerson, Roger B; Satterthwaite, Mark A (1983). "Efficient mechanisms for bilateral trading". Journal of Economic Theory. 29 (2): 265–281. doi:10.1016/0022-0531(83)90048-0. ISSN 0022-0531. ^ Rob, Rafael (1989). "Pollution claim settlements under private information". Journal of Economic Theory. 47 (2): 307–333. doi:10.1016/0022-0531(89)90022-7. ISSN 0022-0531. ^ Goldlücke, Susanne; Schmitz, Patrick W. (2018). "Pollution claim settlements reconsidered: Hidden information and bounded payments". European Economic Review. 110: 211–222. doi:10.1016/j.euroecorev.2018.08.005. ISSN 0014-2921. ^ Greenstone, Michael; Jack, B. Kelsey (2015). "Envirodevonomics: A Research Agenda for an Emerging Field". Journal of Economic Literature. 53 (1): 5–42. doi:10.1257/jel.53.1.5. ^ Inclusive green growth the pathway to sustainable development (PDF). Washington, D.C.: World Bank. May 2012. pp. 12–13. ISBN 978-0-8213-9552-3. Retrieved 15 January 2015. ^ Faure, Michael G. (2003). The Economic Analysis of Environmental Policy and Law: An Introduction. Edward Elgar. ISBN 9781843762348. Perman, Roger; et al. (2003). Natural Resource and Environment Economics (PDF) (3 ed.). Pearson. ISBN 978-0273655596.